When we run our Bird Island Knowledge Management simulation, we put people into separate teams, working out of sight of each other, and we give them a task to build a construction; as tall as possible while passing simple tests. At the end of 20 minutes they have finished their construction, they feel proud of what they have achieved, and think they have done pretty well. maybe they could have built a little higher, but not by much. Then we open the doors and let them exchange knowledge with each other. Invariably they find that the others have got different designs, smarter approaches, and sometimes have built constructions to a height that others thought impossible. The teams begin to re-use each others' ideas, and their next construction is much higher as a result. Performance has increased through knowledge sharing. This is "KM in a laboratory setting" but exactly the same can be true at work. Let's assume you are working in a business with multiple operating or manufacturing sites. Operations cost or manufacturing cost will vary from site to site, and often each site will use different approaches, different designs, different management systems. They work in isolation, they don't know what good ideas the others are using. Knowledge Management gives you the opportunity to reduce these costs, by sharing learnings and good practice from low cost sites, to improve the performance of high cost sites. As an example, in the 1990s we worked with the refineries in BP to help reduce the costs of planned shutdowns. Historical data showed that if all refineries could reach the level of top quartile, there was a prize of £30m available to the business. The business estimated that an improvement on the existing level of knowledge sharing could deliver $5m of this, while no knowledge sharing could lose $10m. This return more than justified an investment of $230,000 in a community of practice, an online knowledge asset, and a series of Retrospects and Peer Assists, and so a robust business case was constructed. Another one of our clients looked at one of their major cost elements, water usage, and benchmarked this around their global sites. 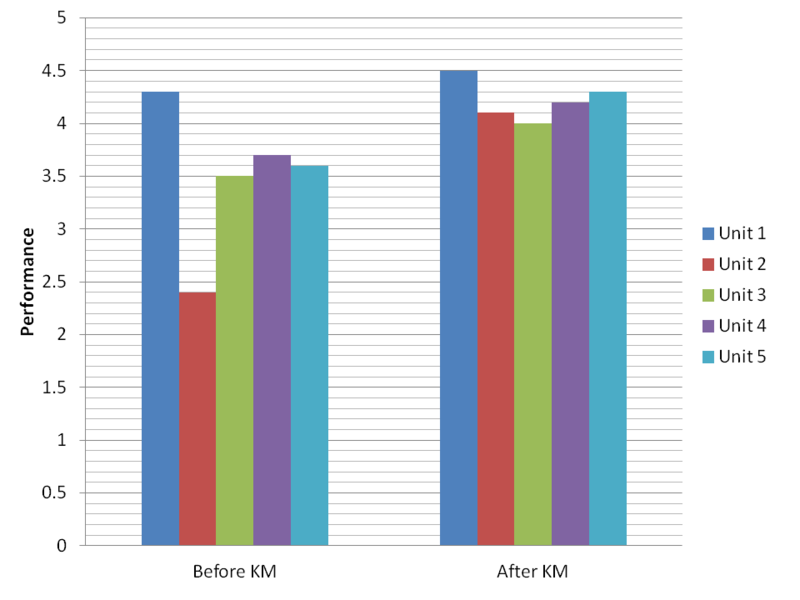 They set a target of top quartile, and assumed that KM, at the very least, would move each site 10% of the way towards this top quartile target. Even this modest estimate of improvement was worth $7m annually to the organisation, which would more than cover the costs of the Community of Practice required to facilitate the exchange of knowledge. Simple calculations such as these can be used to help build a business case in any multi-site operation where performance varies between the sites, whether it is operational cost (as described above), sales results, time to market, customer satisfaction, cost of quality, or any other metric you care to mention. And if you really want to convince the business that KM will improve these metrics, take the managers through the Bird Island exercise.